Click here to download PDF of recipe with no photos. Prep – thinly slice onions. Peel carrots and cut into 1-inch pieces. Thaw demi-glace (if using frozen) or prepare (if you have concentrated demi-glace on-hand). Tie bouquet garni. Chop some flat parsley if you want to use it for garnish. Cut the meat into 1.5 inch pieces. 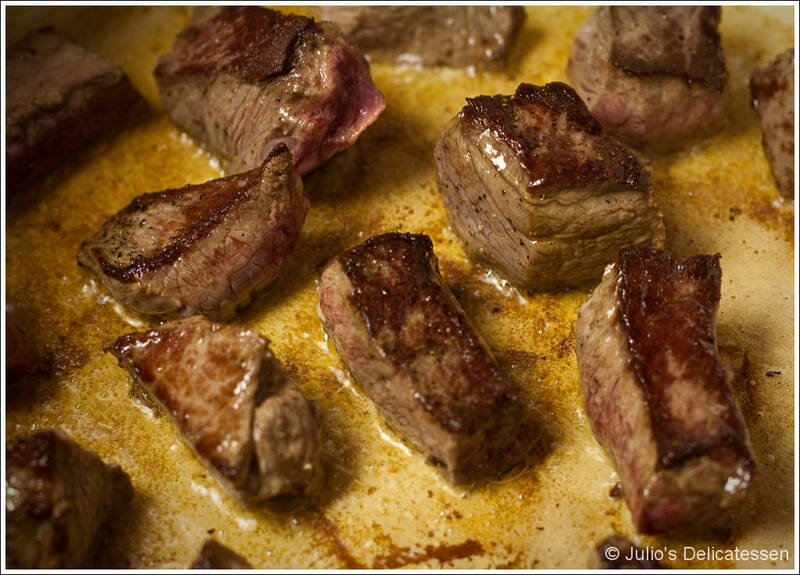 3:30 before mealtime– Set the meat on the counter for a few minutes to let it begin to warm up to room temperature. Heat a generous amount of oil (enough to cover the bottom of whatever size pot you’re using) in a dutch oven or large pot. GENEROUSLY Salt and pepper the meat on all sides. 3:25 before mealtime – Brown meat, on all sides, in batches (so there’s plenty of room in the pan). You’re going for BROWN. Remove from pot and place on a large platter to rest while you do the next few things. 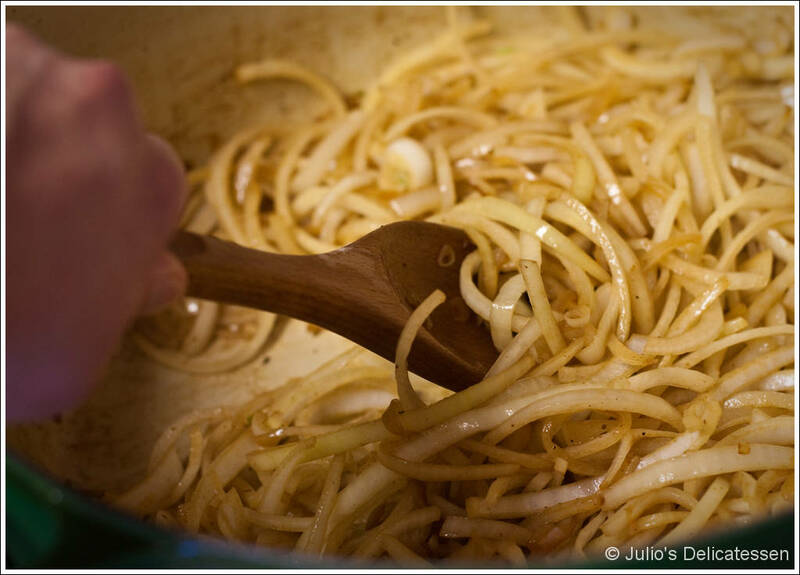 3:05 before mealtime – After the meat has all been browned and is resting on a platter, add the sliced onions to the pan. Sautee until nicely browned (and until there is no more fond on the bottom of the pot because the onions have taken on the color and flavor), about 10 minutes. 2:55 before mealtime – Sprinkle the flour over the onions. Stir constantly for about two minutes. Preheat oven to 325 degrees. 2:50 before mealtime– add the wine and stir until wine comes to a boil. 2:45 before mealtime – Add the mushrooms, carrots, beef (along with any liquid that accumulated on the platter), demi glace, and boquet garni. Add just enough hot water (a kettle works well to heat and transport the water) to barely cover the meat and vegetables. Bring to a boil. 2:30 before mealtime – When the stew has reached a boil, cover (either with a lid or – better yet – a parchment lid) and move to the oven. Let it simmer in the oven until the meat is fork tender. This should take roughly 2.5 hours. Stir every 45 minutes or so. 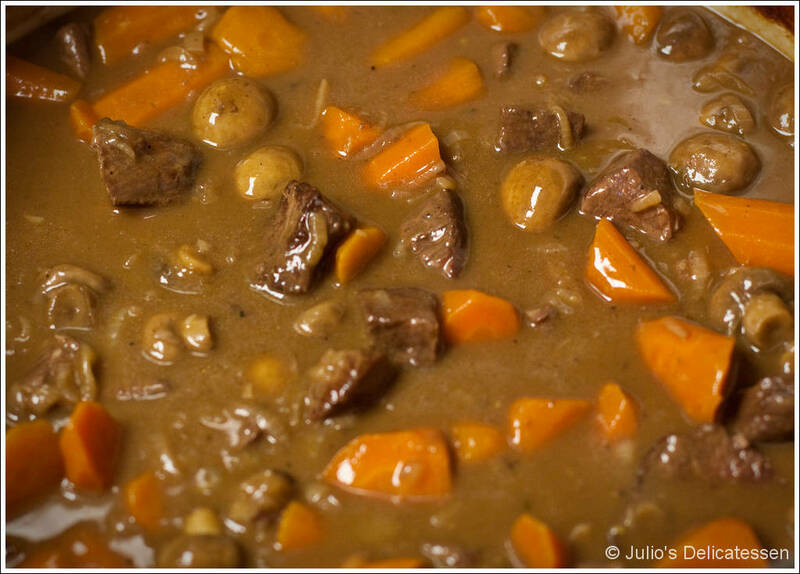 Dinner time – When meat is fork tender, the stew is ready to serve. If you’re also ready, taste, adjust seasonings, add the parsley if you like, and serve. If you’re planning to serve it later the same day, feel free to set it on the counter until you’re ready. Bring it back to a light simmer over medium heat on the stove or in a 300 degree oven. If you want to serve the next day, allow to come to room temperature on the counter (or, if you’re expecting a health inspector, in an ice bath) before refrigerating. Reheat as described previously.